Hello all – I am pleased to advise that the new Teewah launch is now open for operation. This project which had its genesis a number of years ago was finally completed yesterday afternoon and cleared by Queensland Parks & Wildlife officials for use. The picture above shows some of the QP&WS staff and club volunteers who participated in the final working bee. To the right can be seen the site of the former wooden ramp which is now closed for re-generation. 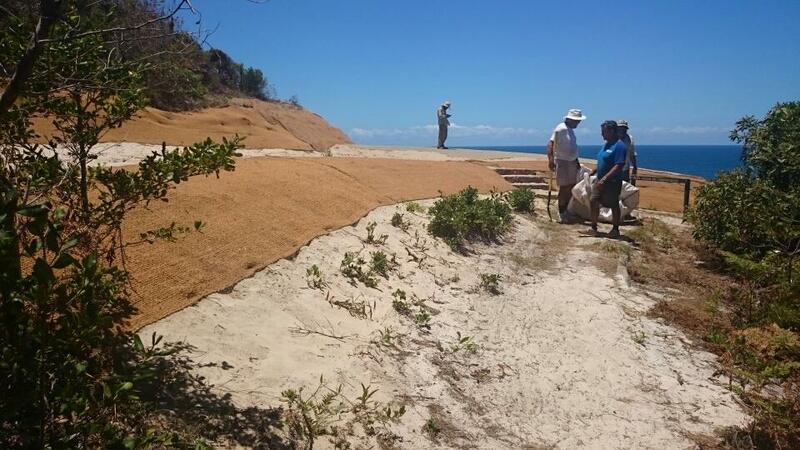 The following image shows the new set up area leading down to the launch – there will be some new steps constructed in the foreground (likely to occur next week) to the immediate left in the photo to ensure the hessian covered areas are not disturbed.The launch area is covered by trail pads which will stabilise the dune and protect it from erosion whilst allowing new growth to emerge through the pads over time. The underlying root systems will then further stabilise the area. 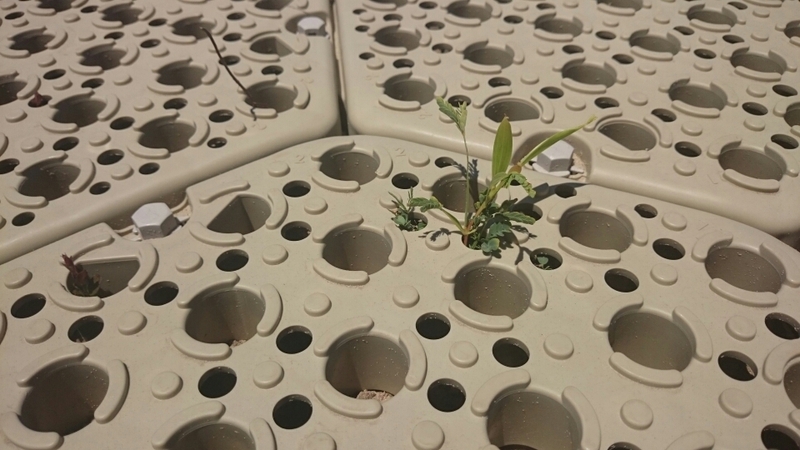 Some regrowth is already starting to emerge through the pads. It is also important to stay off all the hessian covered areas – this is there to protect the dunal area against wind & rain erosion and provide a base for re-generation. The launch is now much more open to the north & south than the old ramp and we believe it will be a safer facility than its predecessor. In siting & constructing it there were many issues that needed to be addressed and all involved were constantly looking to find the right balance between the environmental imperatives for the dunal area and the need to ensure the finished launch was fit for purpose and provided improved functionality & safety for users. The track leading up to the launch has also been improved and the entire facility is a great outcome for QP&WS and SCSA. 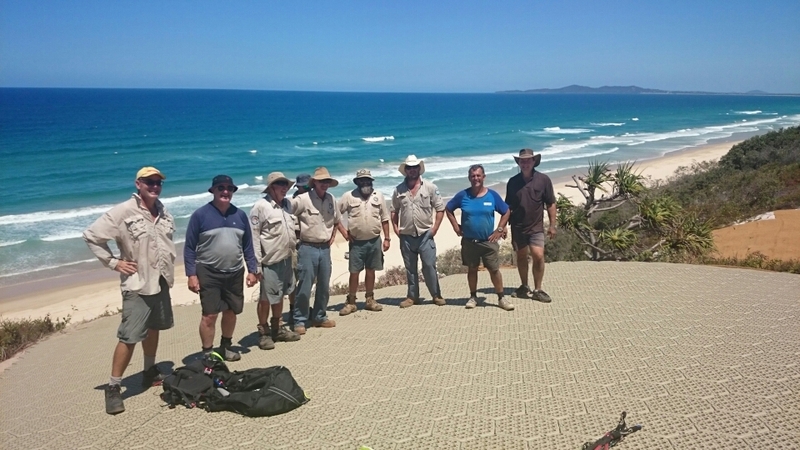 Funding for the project was sourced by QP&WS from monies collected from Cooloola recreation area users (including our own members and commercial operators) and it is a credit to all authorities that these funds are being used to demonstrably improve infrastructure within the same area for park users. I particularly want to acknowledge and express SCSA gratitude to QP&WS Senior Ranger Col Lawton and his staff, in particular Rangers Keiran Hoey, Michael Ford, Mack Middis and Steven Jardine & the many others who were involved in bringing this project to fruition. Thank you too to all the SCSA members who participated in all the working bees and planning meetings – particularly Kent Gosden, Paul Reilly and David Cookman. We will be organising an official opening for the near future which will likely involve a bar-be-que on site to thank all the QP&WS staff – more on this in the next little while. In the meantime the site is open for all members – safe and enjoyable flying to all.